The first American settlers named the American bison a buffalo thinking it was identical to the buffaloes they encountered in Africa and Asia. The misnomer remains uncorrected to this day despite the fact that these are two completely different animals. Their meats are often used interchangeably, particularly in restaurants and supermarkets. Bison meat is considered healthier than cattle meat because it has less fat and calorie content. Regardless, it has a fuller and sweeter taste compared to other meats. It has been found that bison meat is 91% fat-free. The bison is also rich in protein and low in cholesterol. The National Bison Association claims that 3.5 ounces of cooked bison meat contains 143 calories and just 2.5 grams of fat. Bison meat is also said to be a healthy source of omega-3 fatty acids. Bison meat is lean and thus it cooks quickly and becomes tough when overcooked. This is why chefs usually recommend cooking bison steaks medium-done. Moisture can be kept in by searing the meat with a small amount of vegetable oil on high heat and then letting it cook slowly on low heat. 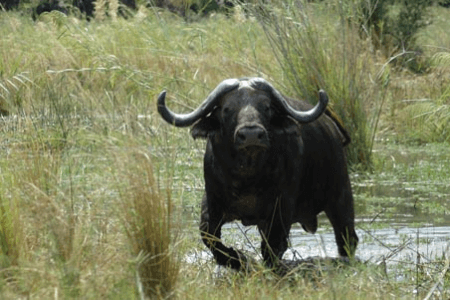 Buffalo meat is from a large bovid called a water buffalo. It is an animal raised for its meat and milk in places like Nepal, India, Bangladesh, Pakistan, Russia, Italy, Czechoslovakia, Bulgaria, and Egypt. Buffalo meat is also known as carabeef in Thailand, the Philippines, and other Southeast Asian countries. Meat from buffaloes less than 20 months old is called padwa in Pakistan and India, or pado in Nepal. Buffalo calves are fed only milk with the sole purpose of making their meat taste better for consumers. Their meat gets mistaken for beef (sometimes on purpose) in some places. Buffalo meat is dark colored with milky-white colored fat. Buffalo meat tastes similar to beef, but is claimed to be a healthier alternative. It has lower fat and cholesterol than beef. In addition, water buffalo meat is known to contain high levels of the omega-3 fatty acids usually found in plant and marine oils. 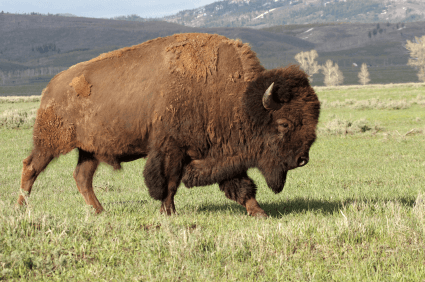 So what’s the difference between bison and buffalo meat? A buffalo refers to the water buffalo found in many countries such as Nepal, India, Philippines, Bangladesh, Italy, and Russia. The word “bison” refers to the American bison (mistakenly called a buffalo) found in North America. Studies suggest that buffalo meat is very low in fat and has the lowest cholesterol of all domesticated meat. In fact, 100 grams of uncooked buffalo meat has 99 calories, 1.4 grams of fat and 20.4 grams of protein. A 100-gram serving of bison meat (lean only) contains 109 calories, 1.84 grams fat and 21.62 grams of protein. Water buffalo meat and bison meat have a dark color. Buffalo meat has white fat, while bison meat has yellow to milky-white colored fat.